Notre Cour Loon Cottage est un chalet traditionnel de boîte de plage qui ne sont pas à votre espace fatigué typique avec des meubles désuets. Ce chalet est lumineux et aéré avec vue panoramique sur l'océan. Le chalet est 3ème chalet de retour de l'océan. La plage est juste un court (1 minute) à pied sur la route privée. Le gîte dispose d'une grande disposition à la greatroom à l'avant et les chambres à l'arrière. La cuisine est moderne avec une conception ouverte, vue sur l'océan de l'évier, un bar et salle à manger qui ouvre sur le pont. Le salon a des vues spectaculaires sur l'océan. La chambre principale est à l'arrière du chalet avec sa propre salle de bain privée et douche à l'italienne. La chambre principale a un lit queen-size, vous pouvez entendre les vagues de l'océan. La deuxième chambre a un lit double-size et la troisième chambre a 2 ensembles de lits superposés avec matelas pleins jumeaux de taille qui peut accueillir confortablement 4 personnes. Le bain de la salle est carrelé et dispose d'une baignoire / douche. NOUVEAU CETTE ANNÉE: rez-de-chaussée, laveuse empilable haute efficacité et sèche-linge pour toutes ces serviettes de plage de sable. Il y a de la place pour 3 voitures pour se garer sous le chalet ainsi que de l'espace pour des véhicules supplémentaires dans l'allée en face du chalet. Il y a une douche extérieure avec un grand dressing et une station de nettoyage du poisson pour préparer les prises de la journée avant de le jeter sur le barbecue au charbon de bois. Apportez vos animaux de compagnie! Deux animaux domestiques bien élevés, domestiques et brisés sont les bienvenus avec la permission du propriétaire. Great location, wonderful ocean view, comfortable house. It was perfect. Loved being right at the ocean! Thank you!! The cottage is in a great location, literally a minute walk to the beach and you can see the ocean from the deck and from the dining room window. We loved our stay and we also loved that we could bring our dog. We would definitely rent again and recommend this cottage to others. Just a few things though, one thing we would have appreciated was if maintenance came to change the air filter once we checked out since this was not emergency maintenance. Thankfully we were available and decent when he came to the door and could also leash our dog while he worked but it would have different if we had been out or occupied. The other, the bed in the master bedroom creaks very loudly. Other than that, we had a fantastic stay. Thank you for making that possible!! Thank you for your comments on your stay at Loon Court Cottage last month. I am happy to know that your vacation was truly enjoyable and relaxing with a great view of the ocean and easy access to the beach. And as for the creaky sounds from the bed in the master bedroom, I expect that with a change in the bed before next year, you should instead hear ocean waves rhythmically breaking out on the beach. A wonderful stay at Loon Court Cottage! What a fantastic place! A little slice of "Beach heaven" awaits you. The pictures posted do not do the cottage justice. Everything is accurate as described/photographed. The view cannot be beat. As one reviewer mentioned, watching dolphins from the house in the morning is a real treat. 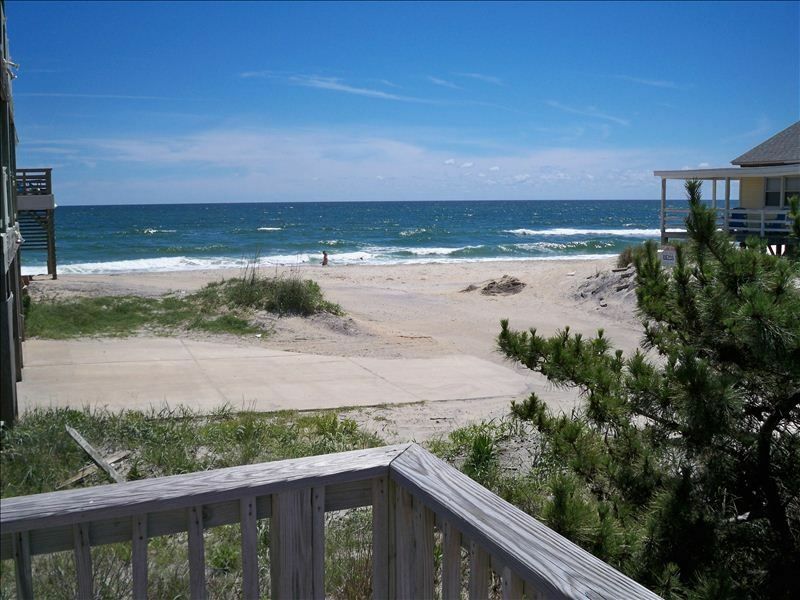 From the moment you arrive, you will not be able to stop looking out the windows at the beautiful stretch of beach just steps from the cottage. It's apparent that the owners have thought of every little detail & comfort for guests. Night lights, paper products and a very well stocked kitchen are available. They even had chip clips! It's little things like this that make the vacation so much more enjoyable. Upon our arrival, the cottage was clean, bright and very welcoming. There is WiFi available and a variety of tourist magazines with nearby attractions. We visited Jockey Ridge State Park, Bodie Island Light and drove over to Roanoke Island for an afternoon. Another day we headed south to Cape Hatteras for shopping and lunch. Make sure to stop by the Cape Hatteras Light on the way. It's a beautiful drive with lots of scenery. We chose to eat dinner out each night and the collection of menus provided was very helpful. We brought our dog on this vacation and found many outdoor places we could bring her along. I emailed the owner while there to let her know how pleased we were with the cottage and we have already booked for next year! She was very prompt with her reply. One of my favorite things was to sleep with the windows open and listen to the sound of the ocean waves. Perhaps it was the time of year (before Memorial Day) but we enjoyed the peace and quiet of the street and found what few tenants/residents to be very friendly. We look forward to our return again next year and hopefully, many years to come! My husband, daughter and myself just spent a wonderful week at Loon Ct Cottage. We’ve stayed at a lot of different beach and mountain rentals and this is one of the best. The location can’t be beat. It might as well be Ocean front. I loved being able to sit at the kitchen table or the love seat in the living room and have unobstructed views of the ocean. It was nice to be able to run back to the cottage to grab a snack or cold drink. No need to lug everything down to the beach with you. The cottage is also very close to the Bodie Lighthouse, less than a 10 minute drive. Also very easy access to Roanoke Island and the Tanger outlet mall. The cottage is very nicely decorated. We found the living room furniture to be so comfortable I would like to purchase the same for my home. There is plenty of seating at the kitchen table. The bathrooms are nice and bright. Everything was so CLEAN when we arrived. I really enjoyed the large walk in shower in the master. Anne was so quick to respond to my request and all follow up emails. She was very easy to work with. Not something I always find when renting on VRBO. My only complaints are 1. The dishwasher doesn’t clean. The first load I ran twice and the dishes were still dirty and I rinse everything before I load them. I ended up hand washing everything, something I do not want to do on vacation. 2. The beds in the back two rooms (queen and double) are very, very loud. They creak at every move. I ended up sleeping most nights in the living room and could still hear the beds when my daughter rolled over in her room or if my husband did in our room through their closed doors. The beds are the only reason I am not giving a full 5 stars for Loon Ct Cottage. Thank you, Karen for your review and I am glad that the setting of Loon Court cottage was relaxing and the proximity of the beach made the coming and going to the beach very quick and easy. Great Oceanview depuis le cottage de Glen Lea Beach à South Nags Head, près de MM 21, à proximité du Cape Hatteras National Seashore, à quelques minutes en voiture de boutiques pittoresques, de restaurants et du parc national Jockeys Ridge.